My newest hobby is playing with my first child Austin. He is one years old now as of April 1st, 2002. Of course he likes snowmobiles!!! Austin at five months old, maybe next year he'll get one for himself. 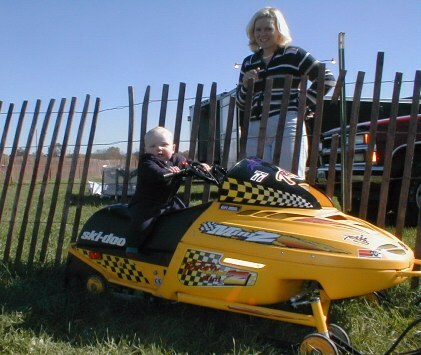 That's my wife Jennifer, she quietly supports my snowmobile and racing habits. Jennifer has her own SRX/part time race sled. We're pretty much a snowmobiing family. In the spring and summer I try to get in a few rounds of golf. The rest of our summer weekends are spent out in Grand Haven on the boat.